Kerry is preoccupied with "everything from Ukraine to South Sudan" and not dealing with Israel-PA peace, says spokeswoman. The United States is not planning to present a new initiative for peace between Israel and the Palestinian Authority (PA), State Department spokeswoman Jen Psaki said on Wednesday. In her daily news briefing, Psaki said that Secretary of State John Kerry was preoccupied with other international matters at the moment. “It remains in the hands of the parties to take – make the choices necessary if they want to resume discussions. Obviously, there’s a great deal going on in the world, and Secretary Kerry is focused on everything from Ukraine to South Sudan, all the issues we talk about in here every day,” she said. Israel pulled out of the talks a few weeks ago in response to a Hamas-Fatah unity agreement, which would see the Hamas terrorist group forming a unity government with PA Chairman Mahmoud Abbas’s movement. 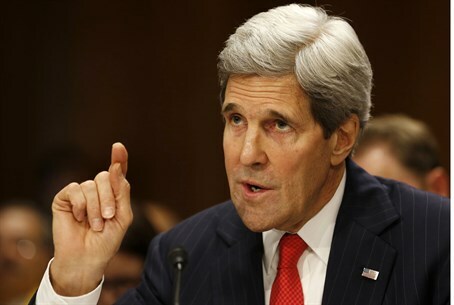 Kerry has remained optimistic throughout the peace process, though even he admitted recently that it was time for the United States to take a "pause" the talks. The report said Obama instructed Kerry to shift his attention to nuclear negotiations with Iran, which are heading into a decisive phase; the crisis in Ukraine; and the longer-term American strategic shift to Asia. That same report also quoted an official who said that Obama believes that Israel’s announcements of new construction in Judea and Samaria were to blame for the failure of peace talks.